Tractor-trailer accident off HWY 76 E.
A tractor-trailer accident that occurred Monday afternoon had many area officials working until dark in an effort to clear the wreckage. 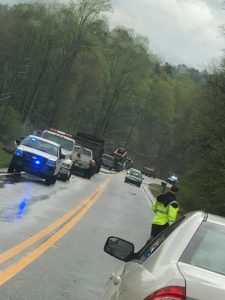 According to the Rabun County Sheriff’s Office, authorities responded to a tractor-trailer that had overturned off of HWY 76 E. around 1 p.m. Traffic was constricted to one-lane only until around 7 p.m. According to the Georgia State Patrol Post 7 in Toccoa Ronald Allen Riley, of Saluda, South Carolina, failed to maintain his lane while negotiating a curve. The tractor-trailer traveled off of HWY 76 E. and down an embankment. Riley and the cab’s trailer overturned and came to an uncontrolled final rest facing northeast on its top. The driver did sustain injuries and was transported via EMS to the Northeast Georgia Medical Center in Gainesville.